An ‘etch mark’ is a dull patch on an otherwise shiny, polished surface. Even if just a small area of a surface is affected, the etch mark still alters the entire aesthetic of the stone - sometimes even more than if the whole surface had been evenly damaged. An etch mark really ‘sticks out’, especially in certain lights. 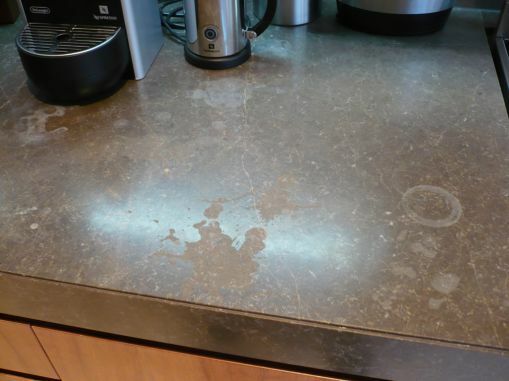 Floor tiles, benchtops or bathroom vanity tops are the most common places for spills that cause etch marks on sensitive stone. Any acidic (or sometimes even alkaline) food or drink can eat into the surface, leaving contrasting etch marks or discolouration on the surface. 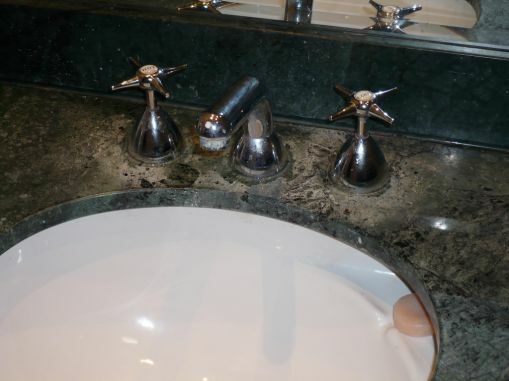 These dull spots can be seen more readily on polished stone surfaces, but also can happen on honed or matt as well. Common culprits are juice, wine, vinegar, urine, vomit or blood. Etching more often occurs on acid-sensitive calcium-based stone such as marble, limestone or travertine. Can etch marks be removed? Polished surfaces can sometimes be spot repaired to remove etch marks and dull spots using a Gleam Restoration process. This is a very delicate process that must be undertaken by an expert if you hope to achieve a reasonable level of restoration. If you have dull spots or etch marks, you can book a free Slique Consultation – we’ll come and confirm your problem, and give you a quote for our Technicians to professionally restore the surface to as-new condition.